The next big thing in audio electronics. Directional mini sound dome speaker headphones beaming private audio to your ears for ultimate comfort. Normally sound domes are hanging from ceilings. They beam directional audio to people directly underneath. The same concept applies to these new ultrasonic headphones. It beams precise planar audio upward and a reflective surface bounces the audio down to the user's ears. This open ear headphone design will be superior to open ear bone conduction headphones in terms of comfort and audio quality. It's like having two directional sound domes next to each ear. Above are pictures of sound domes that normally attach to a wall or ceiling. We're using them as a headphone design. Below is a 3.5 mm design variant and other models will have bluetooth wireless and more sophisticated audio technology. The mini sound domes will be extended millimeters away from the ear so they'll never touch the ear while beaming private audio. Each ear sound dome will have a small cluster of speakers pointing towards the parabolic reflectors so the sound can privately bounce into the ears. An inner spoke wheel within the sound dome will hold the speaker in place. Reflectune headphones can also be used with VR(Virtual Reality) headsets. Reflectors bounce and focus the ultrasound audio to the ears so the user can enjoy private, directional, high quality audio without needing uncomfortable, hot and sweaty ear-pads or earbuds. Are you tired of tight, hot and sweaty ear-pad headphones? 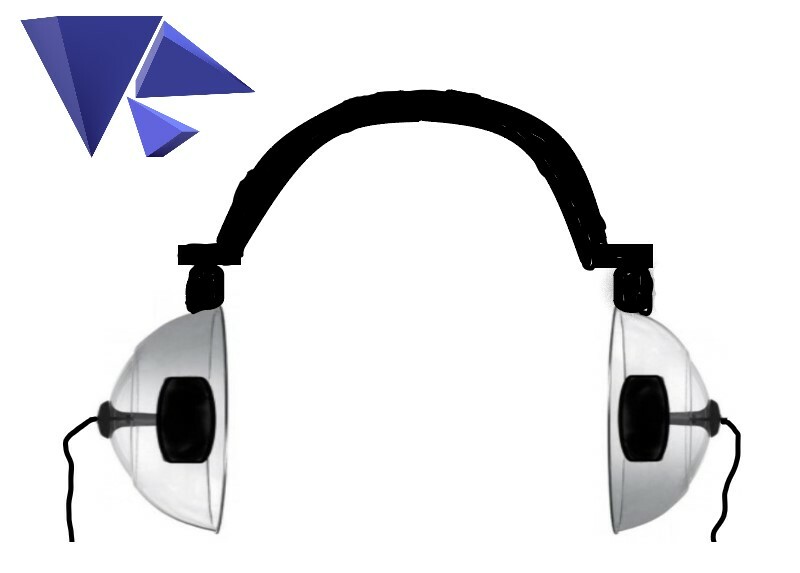 Try out our new ultra comfortable "away the ear" design that will make traditional ear-pad headphones obsolete. The design below is for the general music listening audience. Under the patent(pending) coverage the reflective part can be any shape. The headphone can have one transducer(for each ear) pointed up(or any speaker) and a half dome(or any reflective structure) can reflect the sound into the user's ears. The overall concept is to separate the headphone speaker from the user's ear and bounce the sound down into the ear canals so there is no need for ear pads or ear plugs. Its the same as a person standing underneath a directional sound dome. This design will have better sound quality than bone conduction or other open ear headphone designs and possibility traditional in the ear or over the ear headphones. Warped Dynamics is short for Warped audio Dynamics. The Warped Dynamics company specializes in audio products. Copyright 2018 Warped Dynamics. All rights reserved.